I came across a NIB 97BD and will be meeting tomorrow to get it. Next will be getting a few pieces from CGW. Congrats. I've never had a CZ gun with the decocker. I would be interested in trying one. Great guns, at the very least, I'd recommend the race hammer, but the full Pro Package is well worth the cost IMO. Just did my BD, it's like a whole new pistol. Good luck, and enjoy! Congrats! I have yet to put my paws on a 97, but love the 75 and compact. Everyone says it is big, may I ask you....is it HK Mark23/dessert eagle big in the hand, or is it a typical double stack .45 big? Typical double stack size. I was a little worried also and there is a post about this. The grip is actually a little smaller than the TS grip. I have sets of LOK grips coming for mine since the factory aluminum grips while nice and thin are not grippy enough. I have thins and palmswells coming. The factory grips will go in a bag for keeping the whole gun together. Never held one of those. I haven't ever held one either, just wanted one to go along with my 75 Omega Conv. and my new Shadow 2. I have a 2018 CZ-97BD also. I weighed mine on an accurate digital scale. With 10 rounds of 230 ball, it weighed in at 49 ounces. She’s a pretty big girl. For me, the Alumagrips are perfect. I love the ergonomics of this pistol. I have a shoulder holster on order for it from Kramer Leather. 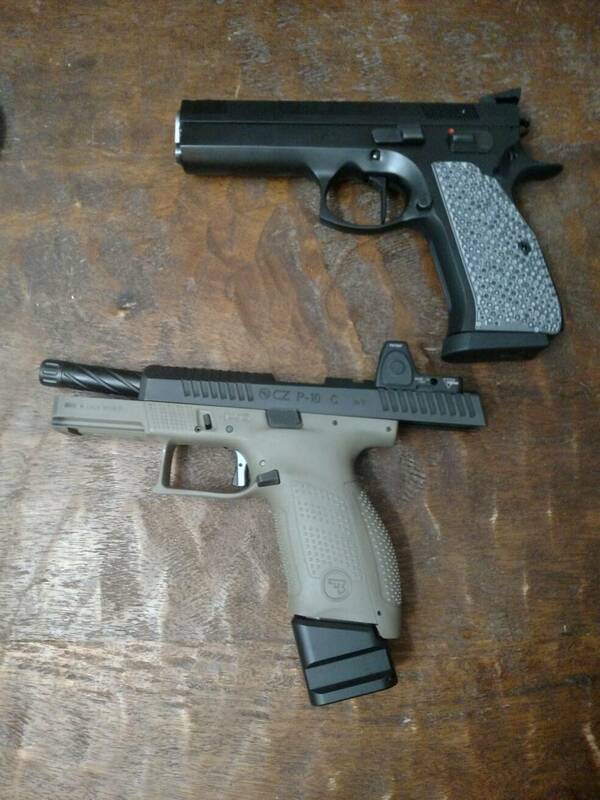 The grip width is definately smaller than Glock 21, and I think smaller than HK USP .45. Thanks for the information! You sure got a nice piece. Merry Christmas to you and yours. For Christmas, my wife gave me a set of LOK Palm swells for my 97. I think they may be a little thinner than the OEM rubber grips. Very nice feel in hand. Congrats! I just a 97 bd earlier this year. It is fantastic. Here is a pic of my 97BD. The fellow I bought if from never shot it, but did buy a set of LOK grips which he threw in. I checked my LGS's online inventory every day for months before finding mine and was waiting for it when UPS dropped it off. I've had my 97BD for about a year now and it's getting more range time than my Colt, Sig and Springfield 45's. It loves about any 200 gr mid range bullet and the more I shoot it the better the trigger feels. I hope you enjoy your new pistol as much as I do mine. I got lucky, my LSG had a brand new 97 B sitting under glass just last September when I was shopping for a new toy. Came back later and got a SP-01 also. Now I want a CZ in some sort of compact fashion also (either P01 or 75 Compact). I have owned a lot of hand guns and the only I have found addicting are revolvers and CZs. I'm in California and got the stock wood grips and like tem very much. I bought set of thin grips and sent them back. I like the little bit of extra girth the wood grips have. It fills my hand better. To describe the size with the wood grips, definitely like a double stack 1911. @ lewmed - That's odd that yours likes 200gr, mine would print low with 200gr, SP (standard pressure) or +P. I have shot a lot of different ammo and the only thing that print POA is SP 230gr FMJ or HP. Every thing else would print anywhere from 2" to 4" low at about 7 yards. It seems like once I got over a regular velocity or under the standard weight (SP 230gr @~ 850-900fps is what I conceder standard for 45acp), the faster the bullet the lower the impact. Makes sense I guess. I am actually not impressed with the accuracy in general. My SP-01 is a tack driver out of the box, the 97 not so much. Not bad, just not good, not near what I was expecting. I would say its as or maybe less accurate than a 1911 in the same price range and I think my expectations were too high. I plan to do the CGW 1911 barrel bushing upgrade some time this year, that will fix my expectations, lol. I will likely do some other work but that where I want to start. I also realized it is a great bedside gun so I want to add a rail. I didn't really understand how a rail mounted flashlight is helpful until I got my SP-01 and toyed around with one. Now I get it, you can light up a room without pointing you gun at someone. Derp. cwmoss - great purchase, welcome to the club. Here is my 97B with my 2 other big boar hand guns. 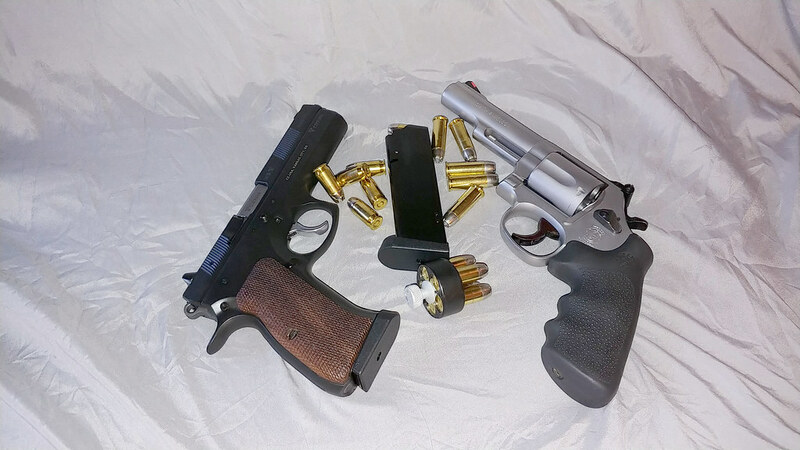 CA Bulldog and S&W M69 w/ X-frame grip. I am an M69 fanatic, I think they are extremely under rated revolver. Another of my 97 and M69..
CaliforniaGunner The bullets I've found most accurate in my 97BD are all 200 grain. Bayou coated SWC, RCBS .45 200-SWC #460, and Everglades 200 gr RN plated. All mid range loads with 4.8 gr - 5.2 gr of 231 and Fed. primers. I have no problem keeping 10 rounds on a 2" shoot-n-see dot at 15 yards. My gun is factory stock except for a CGW extended firing pin and a few springs. 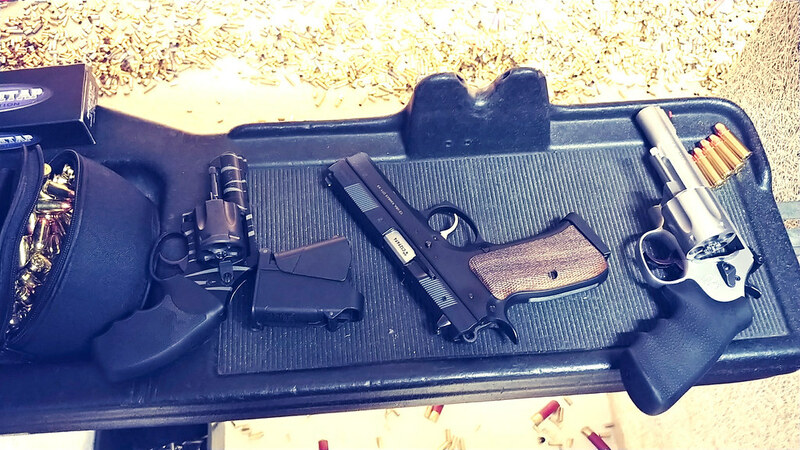 The 97 is more accurate and more fun to shoot than my Colt Custom Gun Shop Gov. model my Sig P220 or my Springfield and is getting the most range time. Enjoy your 97 you made a good choice it's a fine pistol and try some shots out to 15 or 25 yards.